I met Raven in 1996, long before either of us were anyone — in fact, his first art gig was with Shadis magazine — and certainly long before he was as good as he is now. Raven’s work spiked around 2000, and before I knew it he was too good to hire (read expensive). He’s been dominating at Wizards and White Wolf for years. Below is a Lich Beholder thing from some D&D product and a sample of how deadly Raven is with paints. I love the runes on this, the emerald in the bottom left tentacle, and the battered nature of the piece. Raven is a maestro with the details. Take a look at more of his work at www.ravenmimura.com. As for this bad boy, if you intend to drop him into your games, I recommend doing something cool with the runes. 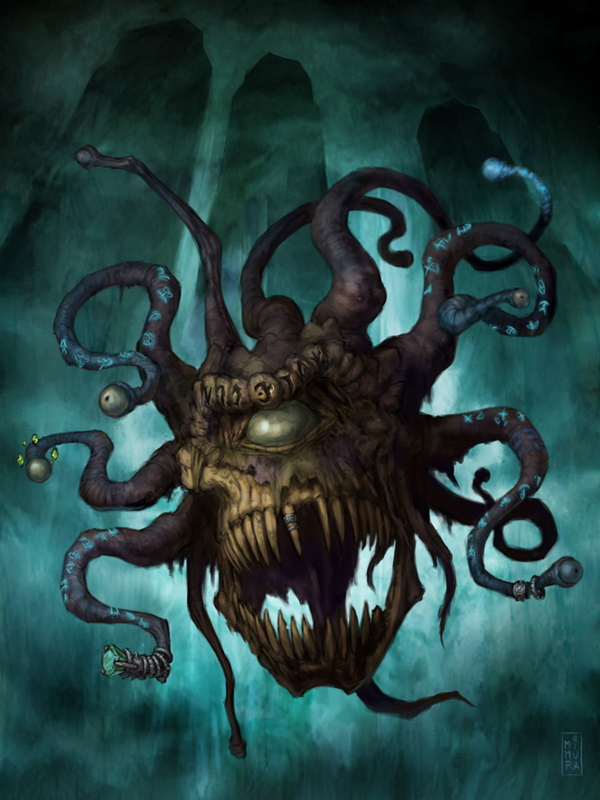 Make them permanent effects that have been magically seared into the beholder making him even more powerful than he normally is.